Susan Reimer Service Details - Franklin, New Jersey | F. John Ramsey Funeral Home, Ferguson Funeral Home Inc, Ferguson-Vernon Funeral Home, Inc.
Ogdensburg, NJ: Susan Beth Reimer(nee Dougherty), 62 years old, died after a long illness at Morristown Medical Center on Wednesday, October 31, 2018. Born to Robert John and Irene Dougherty in Ridgewood, NJ, she had lived in Bloomfield, NJ before moving to Ogdensburg, NJ in 1987. Susan received her BA in Business Administration from Montclair University and worked as a Project manager for Prudential Financial in Newark, NJ for many years retiring in 2014. 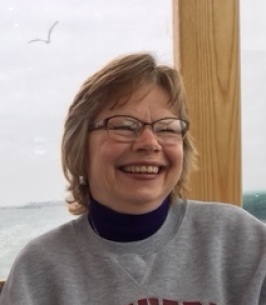 Susan was an active parishioner of St. Thomas of Aquin RC Church, Ogdensburg, serving as a lector, volunteered on the advisory board, the financial council, and the social action committee as well as serving as president of Rosary Society. She also volunteered with the Literacy New Jersey, working as a tutor, developing the training programs and training the trainers as well as running ESL(English as a Second Language), Citizenship, and Conversation classes. Susan volunteered at the Catholic Family and Community Services Thrift Shop and also worked with the reading program at Ogdensburg School. Susan took great joy in the outdoors, hiking and camping as well as quality time with her dog, Winston. Susan is the beloved wife of Fred Reimer of Ogdensburg, NJ. Dear sister of Ann Seifert of Greenwood Lake, NY and Robert Dougherty and his wife, Kathy of Rumson, NJ. Loving aunt of Stephanie Arenius and her husband, Ed of Greenwood Lake, NY, Michael Seifert of Greenwood Lake, NY, Kelly Walz and her husband, David of Rumson, NJ, R.J. Dougherty and his wife Nicole, of Arlington, VA, Michael Dougherty of Laurence Harbor, NJ, Jack Vorsheim of Basking Ridge NJ,and Beth and Dawn Reimer of Belle Mead NJ. Daughter in law of Gerta Reimer of Somerset NJ. Sister in law of Linda Vorsheim and her husband, Gary of Basking Ridge and David Reimer and his wife, Louise of Belle Mead. The family will receive their friends at F. John Ramsey Funeral Home, One Main Street, Franklin, NJ on Friday, November 2, 2018 from 2 – 4 and 7 – 9 PM. Funeral from the funeral home on Saturday, November 3, 2018 at 10:00 AM. Mass of Christian Burial at St. Thomas of Aquin RC Church, Ogdensburg, NJ at 11:00 AM. Interment to follow at St. Thomas Cemetery, Ogdensburg, NJ. Memorial gifts to St. Thomas of Aquin RC Church, 53 Kennedy Avenue, Ogdensburg, NJ 07439 or the nature Conservancy, Adirondack Chapter, 8 Nature Way, P.O. Box 65, Keene Valley, NY 12943 would be appreciated. I feel extremely lucky to have spent so much time with Sue during my years at Pru. A role model, a mentor, a co-worker and most importantly a good friend. You will be missed. I worked with Sue at Prudential and am very sorry to hear of her passing. My condolences to her family. May you find comfort in your memories of Sue. I will never forget the care, wisdom and just plain smarts she brought to all she did on behalf of literacy.